George Cruikshank (1792-1878), began his career as a caricaturist and illustrator, becoming a successful cartoonist and social satirist while still a young man. Working with both wood and steel engravings, he limned a remarkable number of illustrations in the style of Rowlandson and Gillray that portrayed the British way of life. He observed society with visual brushstrokes, whereas Jane Austen used pen, ink, and words. 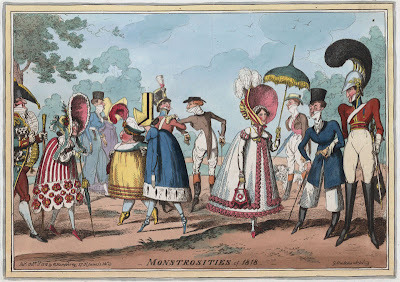 In these two hand-colored etchings (there are more in the series), Cruikshank exaggerated the fashions of the time. According to one reference, the black poodle as shown in Monstrosities of 1821 is a symbol of dandyism. 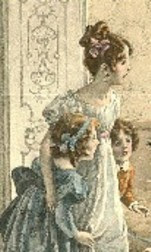 Jane would not have seen these prints, as she died in July of 1817, but her sister Cassandra might have. 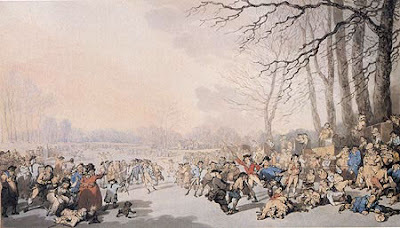 Cruikshank was enormously popular during his day and his prints were widely distributed. Learn more about George Cruickshank in the following links. Took four hours to dress; and then it rained; ordered the tilbury and my umbrella, and drove to the fives’ court; next to my tailors; put him off after two years tick; no bad fellow that Weston…broke three stay-laces and a buckle, tore the quarter of a pair of shoes, made so thin by O’Shaughnessy, in St. James’s Street, that they were light as brown paper; what a pity they were lined with pink satin, and were quite the go; put on a pair of Hoby’s; over-did it in perfuming my handkerchief, and had to recommence de novo; could not please myself in tying my cravat; lost three quarters of an hour by that, tore two pairs of kid gloves in putting them hastily on; was obliged to go gently to work with the third; lost another quarter of an hour by this; drove off furiously in my chariot but had to return for my splendid snuff-box, as I knew that I should eclipse the circle by it. 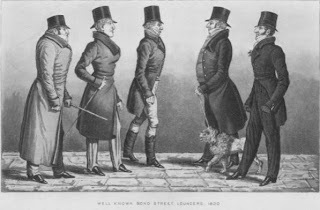 Beau Brummell was the quintessential dandy of the era. Dandies are described in Prinny’s Set on the Georgian Index. Find a short history of Brummell’s most famous sartorial contribution on the The White Satin Cravat. 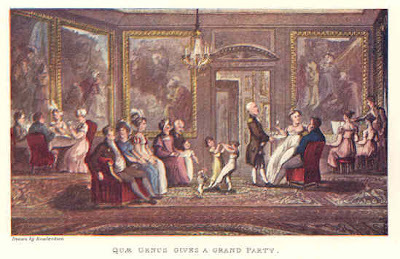 What did a New Year’s Eve Celebration look and feel like during the time of Jane Austen? 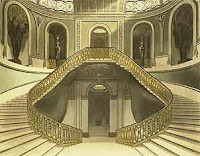 This English Country House site gives you a good idea. You can still celebrate New Year’s Eve at Hunstrete House in Somerset much as they did in the 18th & 19th Centuries. Visitors are greeted by a cheery log burning on the fire, and are called to afternoon tea. The most commonly sung song for English-speakers on New Year’s eve, “Auld Lang Syne” is an old Scottish song that was first published by the poet Robert Burns in the 1796 edition of the book, Scots Musical Museum. 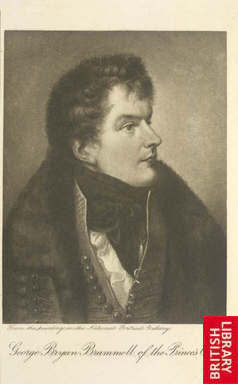 Burns transcribed it (and made some refinements to the lyrics) after he heard it sung by an old man from the Ayrshire area of Scotland, Burns’s homeland,” Borgna Brunner . Click here for my other New Year’s Post. Happy Christmas! 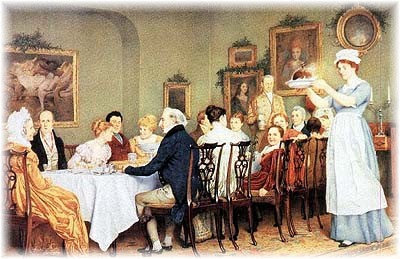 The Christmas season in the early 1800s was a time of festive balls, dinner parties, and parlor games as described in Christmas Regency Style and a Jane Austen Christmas. While Christmas decorations in the form of garlands and mistletoe were put up on Christmas Eve and a yule log was cut and burned, the custom of ornamenting christmas trees, swapping Christmas cards, and singing Christmas carols did not become widespread until the Victorian era. Click on the links below to learn how Christmas was actually celebrated during Jane Austen’s and the Prince Regent’s time. View all my other holiday posts here. The day after Christmas is called Boxing Day in England. December 26th was also known as St. Stephen’s Day, after the first Christian martyr. Money was collected in alms-boxes placed in churches during the festive season. This money was then distributed to the poor and needy after Christmas. Boxing Day was first observed during the Middle Ages. 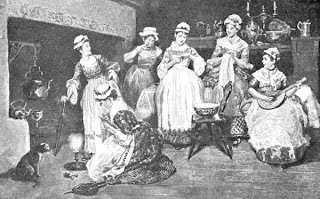 In Jane Austen’s time the upper classes presented gifts in boxes to their servants on December 26 for good service the day before and during the previous year. The servants were often given the day off, and if December 26 fell on a Saturday or Sunday, Boxing Day took place on the following Monday. 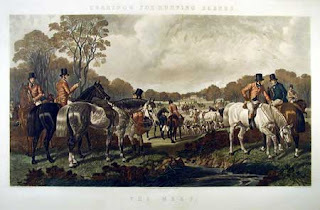 Boxing Day was also a traditional day for fox hunting. Learn more about Boxing Day on the All About Christmas website. This Snopes article about Boxing Day and its origins provides a more extensive overview as well: Click here. Click on The Book of Days and then the Calendar of Days to learn more details about these yearly events and how and why they are celebrated. 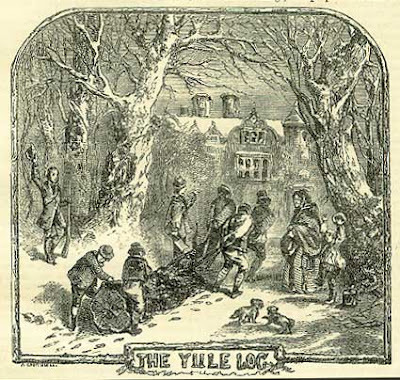 An enormous log of freshly cut wood called the Yule log was fetched and carried to the house on Christmas Eve. In England it was the custom to burn the log for the twelve days of Christmas, from Christmas eve on December 24th to Epiphany on January 6th. 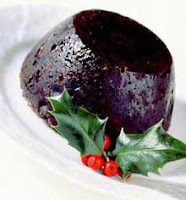 For more about the Christmas Pudding, click here. Check recipe for shopping/store cupboard purposes and grease 1 basin. Mix all the dry ingredients together except the baking powder. Add the beaten eggs and sufficient milk to moisten the whole, then cover, and let the mixture stand for about an hour. When ready stir in the baking powder, turn into a greased mould or basin, and boil for 6 hours or steam the plum pudding for about 7 hours. Serve with a suitable sauce. Time 6 to 7 hours.